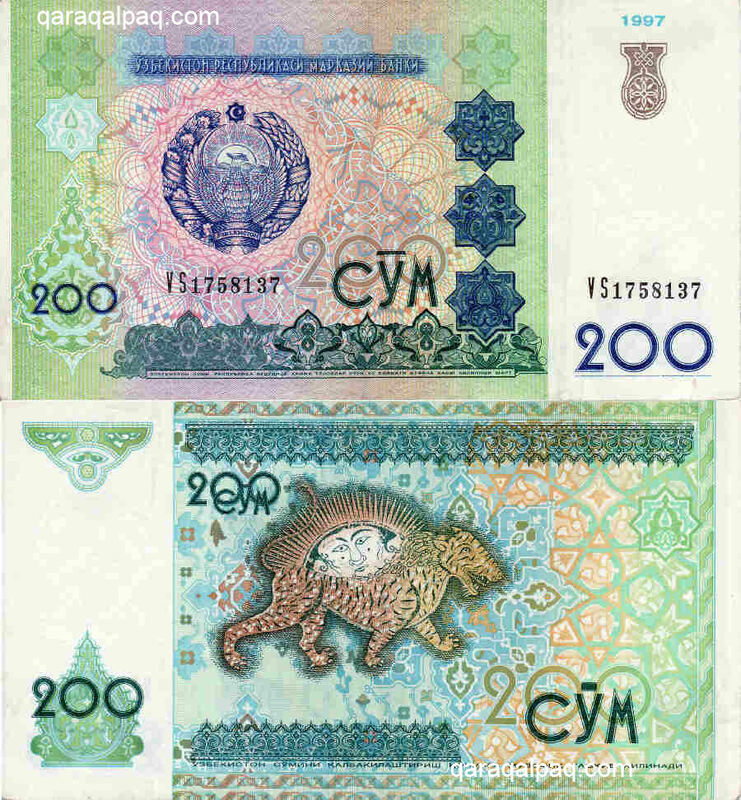 As an integral part of Uzbekistan, Qaraqalpaqstan uses Uzbek currency as its means of exchange. 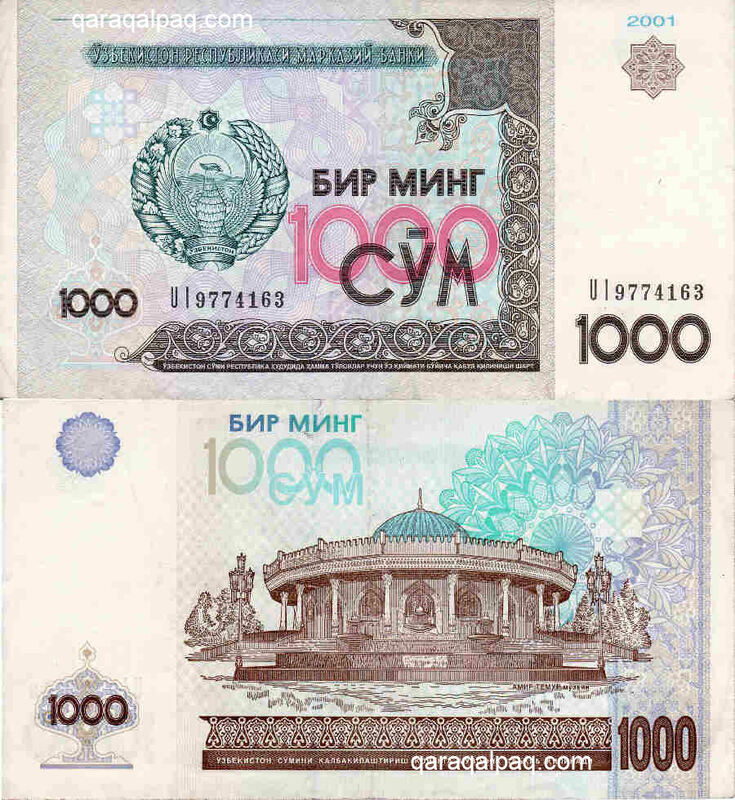 The Uzbek unit of currency is the so'm, commonly written som, and sometimes mistakenly transliterated as soum or sum. It is denoted by the ISO code UZS. 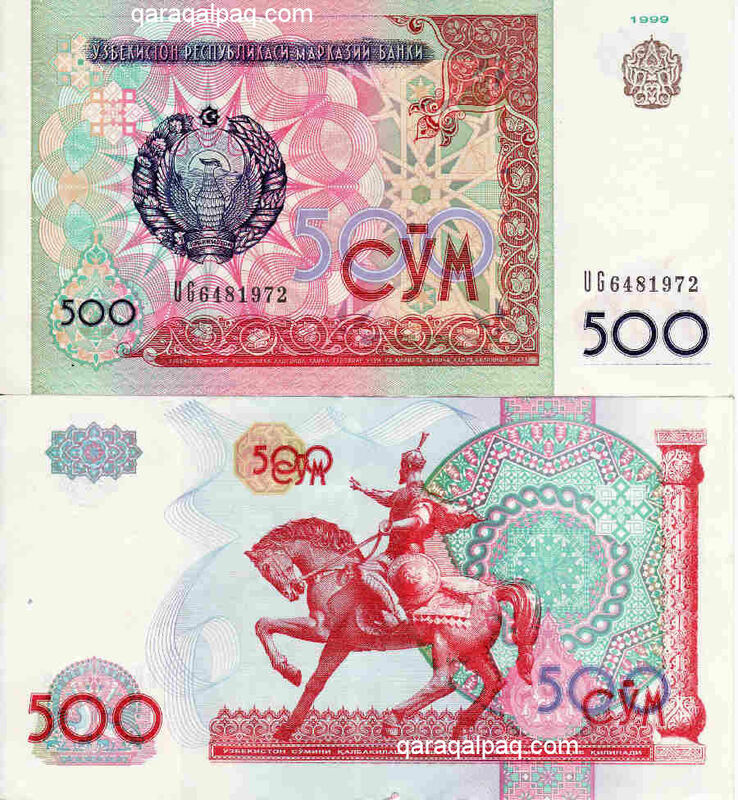 Uzbek 500 and 1000 so'm bank notes. So'm is a Turkic word meaning pure and it was formerly used during Soviet times to denote the Russian rouble, implying that it had the value of pure gold. Sadly this turned out to be not the case. Following the collapse of Communism the rouble went into a nose dive. For the first two years of its independence Uzbekistan continued to use the Russian rouble. However when Russia redefined the rules of rouble-zone membership at the end of 1993, Uzbekistan decided to launch its own currency rather than hand over its gold reserves to Moscow. 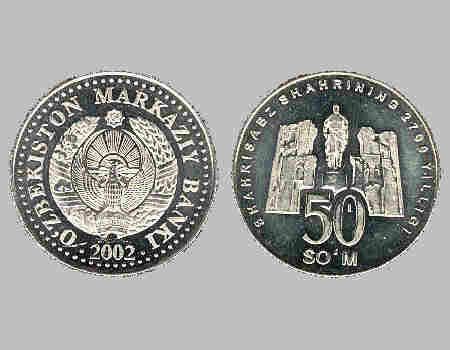 The Uzbek so'm was introduced on 22 November 1993 in parallel with, and on a par with, the much devalued rouble. On 1 January 1994 it became the single legal tender, replacing the rouble entirely. It was only available in the form of whole so'm notes with no subdivision into smaller coinage. The introduction of the so'm was associated with colossal inflation as the government issued paper to subsidize the ailing economy - the initial so'm coupon lost 90% of its value in six months. The result was catastrophic for the population of Uzbekistan and Qaraqalpaqstan. People saw the value of their savings destroyed and the middle classes were effectively eliminated. On 1 July 1994 a new so'm unit of currency was introduced at the rate of 1,000 old so'm for one new so'm. This too has progressively devalued over the years, although not so precipitously as the old so'm. The new so'm was valued at 7 to the dollar at the time of its introduction. The official rate fell to 40 to the dollar in 1996 and 112 to the dollar in 1999. In 2008 there are 1,300 so'm to the dollar. 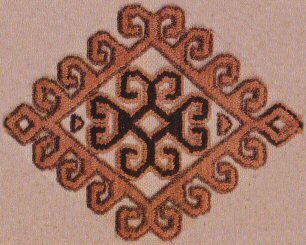 The new so'm was divided into 100 tiyin (sometimes written tiyn, tien or tyn). 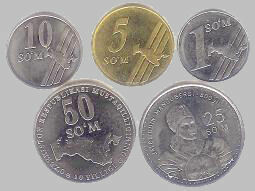 The 50 so'm silver coin. A selection of small so'm coins. 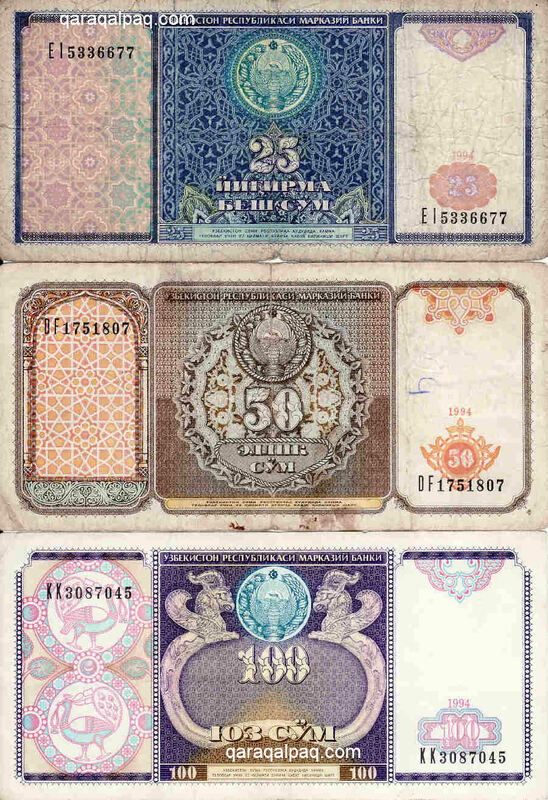 The Uzbek so'm is now available in denominations of 1000, 500, 200, 100, 50, 25, 10, 5, 3, and 1. The most convenient notes for a tourist are 500 and 1,000, plus a few 100 and 200 for small change. In the past 1,000 so'm notes have been hard to come by, leaving you forced to carry around a bag full of 200 so'm notes instead (you get 650 of these in return for $100). Uzbek 200 so'm bank notes. The so'm is still not fully convertible and its export is prohibited. You will therefore have to obtain your currency locally. The import and export of currency is strictly controlled in Uzbekistan. Non-resident visitors can import an unlimited amount of foreign currency in the form of cash or traveller's cheques, but this must be declared on your duplicate customs forms on arrival, one copy of which you must present when leaving the country. However according to a Presidential Decree dated 20 March 1998 if the imported amount exceeds $10,000 it will be subject to a 1% duty on the amount. It is sometimes stated that passengers carrying more than US$1,000 may be physically checked, but we are unaware of this happening to any tourist. Local residents are far more likely to be searched than tourists. Non-resident visitors can export foreign currency up to the amount declared upon arrival. Proof of lawful exchange into so'm can be demanded from visitors who have spent more than $2,000 and those failing to submit this proof can be fined 30% of the total amount imported. Again we have never experienced any tourist being asked for certificates of exchange in the past. Nevertheless we recommend that visitors not only keep all official currency exchange receipts but all receipts in general � just in case. Qaraqalpaqstan is almost entirely a cash society, even more so than Uzbekistan. Our personal recommendation is that you bring cash rather than travellers' cheques, and keep it safe by always wearing a secure money belt. Travellers' cheques even cause problems in Tashkent, so we really do not recommend that you bring them to Qaraqalpaqstan. It is claimed that travellers� cheques can be cashed into US dollars at the National Bank of Uzbekistan in Tashkent for a fee of 2% but we have not tested this out at their office in No'kis. In the past the dollar was the only foreign currency that was widely accepted. Today the euro, pound, and many other international currencies are readily accepted in exchange centres in Tashkent, Samarkand, and Bukhara, but again you are likely to encounter problems if you try to exchange them in No'kis � see below. You should therefore always try and obtain your local currency before you arrive in Qaraqalpaqstan. The exchange desk in your Tashkent hotel, if you are staying in one, is as good as any other. There are also several handy walk-in exchange booths in the historical centre of Bukhara. You should ensure that the dollar, euro, or pound notes that you bring are all in pristine condition and of recent issue. A 100 dollar bill is a large amount of money for the average local bank clerk to accept, and given the local business culture of fear and blame, none of them dare make a mistake with an unexchangeable torn or tatty bill. Although the notes you give them need to be pristine do not expect the so'm that you receive in return to be in the same condition! Always ensure you count all the bills you are given on the spot even though this can be a lengthy procedure. At the same time don't forget your Visa card. Although you will not be able to use it to buy anything in Qaraqalpaqstan it is a great way to get extra US dollars (and only US dollars) should you run low on cash. The same service is not available using Mastercard or American Express. Credit cards are increasingly accepted at main hotels and a few restaurants and shops elsewhere in Uzbekistan but not yet in Qaraqalpaqstan. Note that to date there are no automatic teller machines (ATMs) in No'kis. Most banks in No'kis are agents for Western Union. A slightly slower way to obtain more local funds therefore is to telephone an overseas relative and ask them to wire you some dollars through their local Western Union office. You should exchange any unspent amounts of local currency prior to departure as there is no exchange office at any of the international airports (Tashkent, Bukhara, or Urgench). The rate of exchange of the so'm is regulated by the Uzbek government. There are therefore two rates of exchange in Uzbekistan, the official rate and the black market rate. In the past there was a big difference between these two, creating huge profits for the Uzbek regime. As such nobody in their right mind ever exchanged their hard currency at a bank, choosing the black market instead. For example in 1997 the official rate was 77 to the dollar but the black market rate was up to 180! Today there is very little difference between the two rates and you would be foolish to change your euros or dollars at anywhere other than an official exchange office � see Regulations below. The current value (March 2008) of the so'm is just over 1,300 to the US dollar. Six months ago it was 1,270 to the dollar. Uzbek 25, 50, and 100 so'm bank notes. To check the current value of the Uzbek so'm, click here. According to current legislation all goods and services must be paid for in so'm. The one exception concerns the payment of hotel bills by foreigners, which must be made in US dollars - even in No'kis. It is also illegal to exchange money anywhere other than at banks or authorized currency exchange offices. The violation of these laws is a punishable offence. Be warned - we know someone who spent several years in jail in Samarkand after having been caught paying someone in US dollars. If you arrive in No'kis with an adequate amount of local currency you should have no need whatsoever to be tempted to change money on the black market. Illegal currency dealers hang around in front of the Central Bazaar and often approach visiting foreigners. This is an exposed position and as a stranger in a strange town you have no idea whether you are being watched by a plainclothes policeman. If you have to get local currency in this manner (and there may be understandable reasons why you have to � see next section), at least get a local person who knows the system to do it for you. Although you are legally obliged to pay your local hotel room bill in dollars, you are under no obligation to pay for your hotel restaurant or other hotel services in dollars. These will nomally be converted from so'm to dollars by the hotel at an unfavourable rate from your point of view. We therefore advise you to save money and pay for such hotel services as you take them using local so'm. Despite the above restrictions and the controls on imported currencies, it is perfectly legal to obtain additional dollars locally using your Visa credit or debit card. 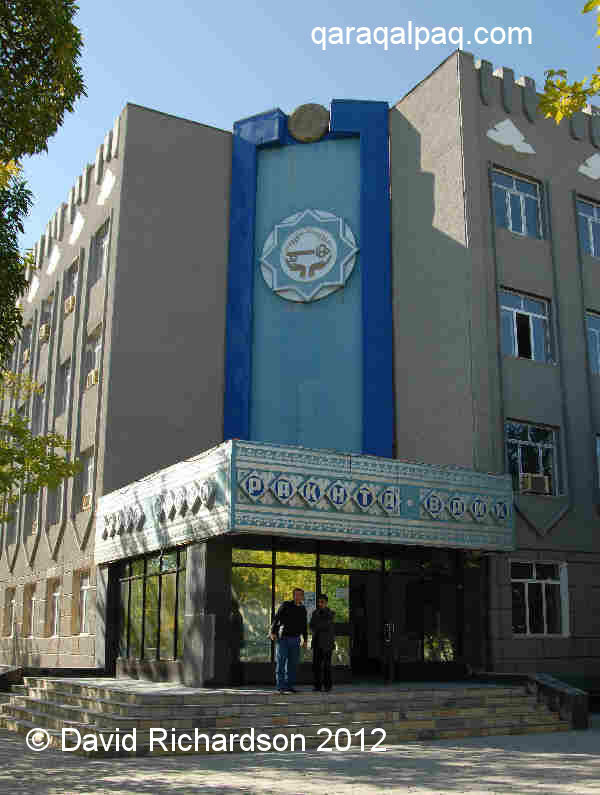 The best place to obtain this service is at the National Bank of Uzbekistan, next to the Council of Ministers building. Local banks like the NBU charge a 3½% commission for this service and it is possible to obtain several thousand dollars in one transaction. All you need is your passport and a little patience as you are shuffled from office to office to have your card and passport details recorded and collect your dollars from the cashiers. Be warned however that the availability of dollars is not always guaranteed and you might have to shop from bank to bank. See the following section. There seems to be a permanent cash shortage in No'kis. Indeed this problem seems to be endemic to Uzbekistan as a whole � we have even experienced problems in Tashkent. In No'kis the problem mainly affects the availability of so'm and this gets worse during the cotton-picking season (September to October), when cash is required to pay the cotton pickers. For example, when we asked to cash some dollars for so'm in the Paxta Bank in October 2007 we were told the maximum we could exchange was $10! We also had problems cashing $100 at the National Bank of Uzbekistan, and only succeeded by going to see the director in charge. There are also occasional shortages of dollars, sometimes coinciding with shortages of so'm! Even when banks have dollars, if they have a limited supply they may limit the amount they are willing to offer tourists per transaction. In the same Paxta Bank last year we met an old man who wanted to purchase $250 with so'm, and was disappointed to find that the bank had none to sell. He had already visited three other local banks that morning, none of whom had any dollars to sell. We re-emphasise that it is best to arrive in No'kis with sufficient local currency to cover your stay. Nearly all of the banks in No'kis are clustered in the small district between the Post Office and Independence Square. Banks like the NBU (National Bank of Uzbekistan) are normally open from 9am to 5pm, closing for lunch between 1pm and 2pm. However others have more restricted hours such as 9.30am to 4pm. Don't arrive just before the staff are about to go home and don't forget your passport. We recommend that you first try the brand new and conveniently located Asaka Bank, which is set back behind the pavement opposite the Regional Studies Museum. The entrance is just up from the corner on Qaraqalpaqstan ko'shesi. The Asaka Bank has a sign on the main Doslıq Guzari road advertising that it exchanges foreign currency. If unsuccessful here, cross the road and try at the NBU the big glass fronted office block next to the Council of Ministers building. The Paxta Bank, meaning "Cotton Bank" - the bank with no cash. The Paxta Bank and the Ipoteka Bank face each other on opposite corners of the street, just behind the Post Office. The Alp Jamol Bank is only 20 metres away from them. For the location of some of the central banks check out our map of Downtown No'kis.